A cargo ship that sailed from the US carrying $US20 million worth of soybeans has been circling off the Chinese coast for over a month. The ship became an internet sensation on Chinese social media as it raced to deliver its cargo last month before new Beijing tariffs took effect. 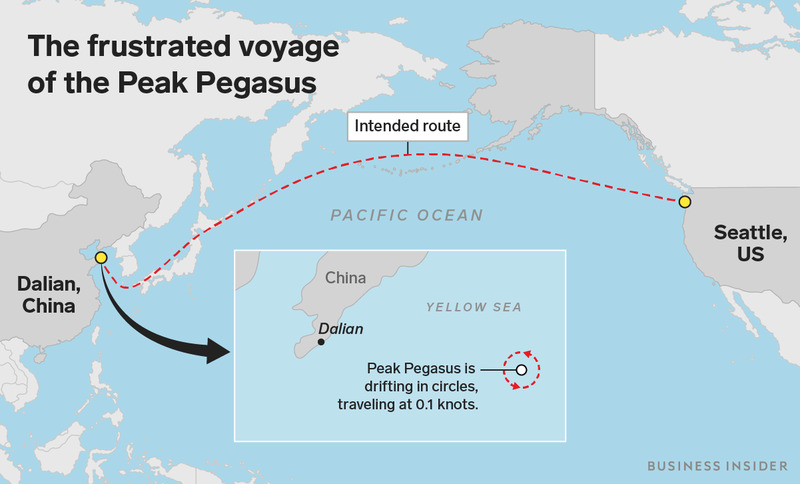 The ship, called the Peak Pegasus, has been drifting in circles off the coast of the northeast city of Dalian ever since it failed to beat the tariffs. Peak Pegasus is a casualty of the US-China trade war. A cargo ship carrying a $US20 million worth of soybeans has been circling off the Chinese coast for over a month after being caught in the middle of the US-China trade war. 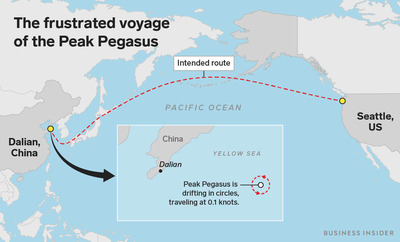 The Peak Pegasus, which is owned by JPMorgan Asset Management, left Seattle on June 8 on a monthlong voyage to the northeastern Chinese city of Dalian. The trade war between the US and China was erupting just as it left, with President Donald Trump imposing tariffs on billions of dollars’ worth of Chinese imports. The ship was due to deliver its 70,000-tonne cargo on July 6,The Guardian reported, but missed the tariff deadline. The Peak Pegasus arrived about five hours after China imposed retaliatory tariffs on US goods including soybeans. The vessel has been off the coast of Dalian ever since and is now drifting in circles at 0.1 knots. The ship – a 47,400-ton, 750-foot-long bulk carrier – has become a symbol of the disruption caused by the trade war between Beijing and Washington. It became a sensation on the Chinese social-media site Weibo, according to The Guardian. The cargo belongs to the agricultural commodity trading house Louis Dreyfus. It is estimated to be paying about $US12,500 a day to continue chartering the ship, meaning the company has already paid about $US400,000 in extra costs since the ship arrived. Commodities experts told The Guardian it could still make financial sense to keep the shipment at sea. The tariff China applied to soybeans just before the ship arrived is 25%, which would add about $US6 million to the cost of importing the soybeans. The US-China trade dispute continued Wednesday, with the US announcing that a new $US16 billion wave of tariffs would take effect August 23. China’s Commerce Ministry described the new tariffs as “very unreasonable practice,” and Beijing responded with 25% tariffs on another 333 US products, also scheduled for August 23.